so iv had my reed going for about a year and a half now. i have some pretty common corals in there but Hey i like them so thats what counts. and ever since about 4 months into the hobby iv had these pain in the @$$ aptasias everywhere, my corals don't like them and i don't like them. i have used in the past Joes Juice. but i'm not a huge fan of using chemicals in my tank. i also know that peppermint shrimp can have a fancy feast on them but i have tryed to put 4 of them in before but never saw them again, i know they are nocturnal but they aptasias seem never ending. so i'm pretty sure they are no longer. maby it was a bad batch of peppermint shrimp but considering they are not that cheap i'm a bit discouraged to try this rout again?! is there anything else anyone knows of that could help me in this predicament?! thanks for all your help!!! much appreciated! 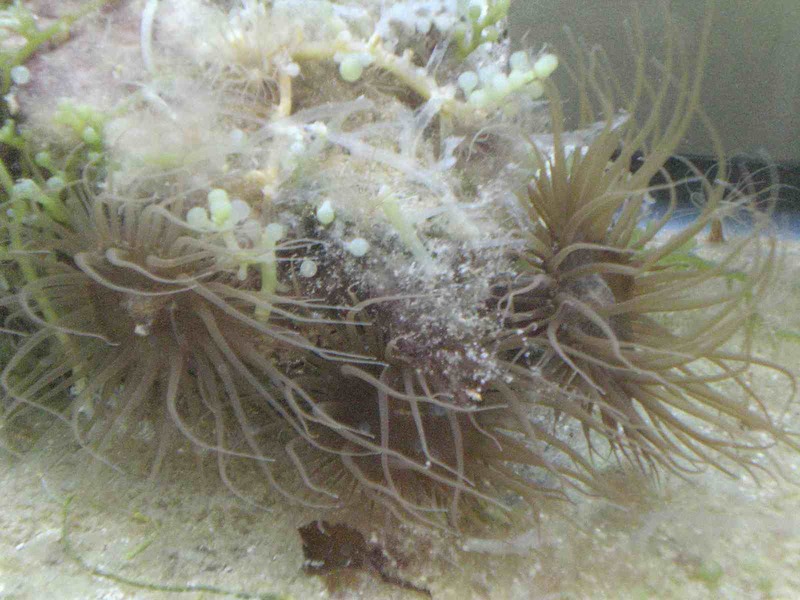 Bergia Nudibranch are very good aiptasia eaters but die once the food source is gone. Copperbanded Butterflyfish are also known to eat them. Our Nudibranch went into our Flu-val.....make sure your screens are REAL small if you chose it! P.S. You should try and post some pics as well. We were convinced there were 2 on one polyp rock and it turns out they are some sort of polyp and not harm full. They are now at about 4 so they are multiplying at a pretty good rate! after being so convinced i had eradicated these pest from my tank with the berghia nudibranches, i found a couple just the other day. i haven't seen one in about 2 years but when i ripped my LR apart, a few popped up. my next plan is to try and manage them rather than exterminate. I have had good, granted only recent, success with peppermint shrimp. Twice I have had visible aptasia on rock I put into my tank and twice my peppermints have cleaned them up overnight. There is debate about ensuring you get the "correct" pepermint shrimp or wether some shrimp are incorrectly identified and sold as peppermint's. Oh yah and someone also mentioned copper banded butterfly i was always told i cant put them in a reef set up, i WISH i could have one because they are beautiful. but i'm scared for my corals. my tank is also a 90 gal so with the fish i have in there i dont think i could manage to put another larger fish in it would be to much! Yep.. that would be aiptasia.. I've also heard lime juice works and yes, Copperbanded Butterflyfish are not recommended for reef setups. If they are only on a few small rocks that are easily removed then they can be treated outside of the tank more easily. Peppermint Shrimp/Copperband butterfly's can eat apstasia but are hit and miss and may or may not do anything. As well they may not eat the entire base which allows regrowth. Bergai Nudibranches - These feed exclusivly on apstasia and are guaranteed to work. If you have a large enough source of apstasia then they may reproduce in your tank, but once the apstasia are gone the bergai will die off. Manual erradication - Manual control can be the easiest/best solution if only a few are present. Injection with Joe's juice or white vingar can kill the apstasia. Smothering with a kalk paste is another option. These methods can stress the apstasia and force them into spawn mode, where you may kill the original but others will appear as a result. To help minimize this do any manual attacks in the morning when the lights first come on and leave them on for at at least 24 hours straight. If stressed apstasia spawn during the night/ dark periods. The problem with apstasia is that if the tiniest piece of the foot remains it can regrow, as well as lay dorment for long periods of time. ok so like i said iv done the vinegar some of them have survived maby i'll try the lime juice next, see maybe that will work better. and all these methods will not hurt my corals?! obviously i'm not going to go and inject vinegar into anything else. just making sure. p.s funny the ones that i got good my cleaner shrimp started to go at and eat the remaining stock or what ever was left!